This arrow speed calculator allows you to accurately determine the speed of an arrow. 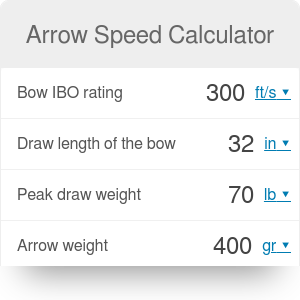 While it is based on the bow speed IBO specification, you can input your individual setting of the bow. It will give you a rough idea of how fast does an arrow travel after you change the bow from the recommended specifications. You can use the results obtained from this archery calculator in the projectile motion calculator to analyze the path of the arrow. If you deviate from these parameters, the arrow speed will not be equal to the one given by the specification. Nevertheless, most archers do not use these exact parameters. This is where this bow speed calculator comes in handy; it allows you to examine how the arrow will behave under a different bow setting. For every inch of draw length under 30″, subtract 10 ft/s from the IBO value. For every inch of draw length above 30″, add 10 ft/s to the IBO value. For every 3 grains of total arrow weight above draw weight multiplied by 5, subtract 1 ft/s from the IBO value. For every 3 grains of additional weight on the bow string, subtract 1 ft/s from the IBO value. D is the draw weight in pounds. Our arrow speed calculator converts the units automatically. If you try to do all of these calculations by hand, keep in mind what units you actually use! Let's consider the following example: you are analyzing the bow of IBO 300. You want to know the speed of the arrow when you increase both the draw length and the arrow weight. Choose the draw length. Let's say it is equal to 32". Decide on the draw weight and the arrow weight. Let's say you keep the regular peak draw weight of 70 lbs, but use arrows weighing 400 grains. If there is any additional weight on the bow string, write it down. Let's assume this weight is equal to 5 grains. Arrow Speed Calculator can be embedded on your website to enrich the content you wrote and make it easier for your visitors to understand your message.